Top weekend picks are trout-stocked waters such as Parker Canyon Lake (50-degree water temperature), Cluff Reservoir (57), Roper Lake (57), Dankworth Pond (58), Apache Lake (57), Canyon Lake (55), Dead Horse Lake (52) or our “core” Community waters (mid-50s to 60). 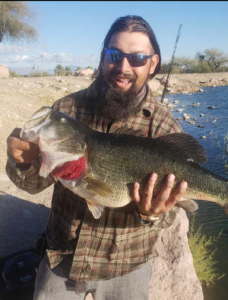 Kennedy Lake in Tucson has been producing some monster bass lately. In January alone, we received reports of an 8- and 11-pound, 9-ounce largemouth bass. See the Catch of the Week. 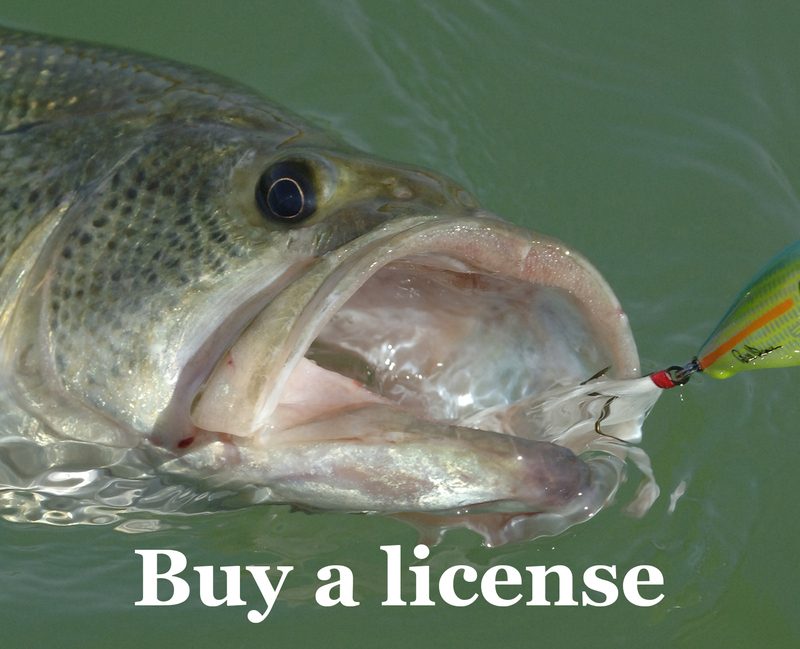 The great news for spring fishing opportunities is that more storms and run-off have produced increased flowing into many streams and impoundments statewide. As of Thursday, some of the highest flows (classified as “much above normal” by the USGS) were at Tonto Creek above Roosevelt (665 cfs), the Agua Fria River near Rock Springs (360 cfs), the Verde River near Paulden (134 cfs), the Colorado River below Palo Verde Dam (8,340 cfs), and the San Carlos River near Peridot (689 cfs). Oak Creek near Sedona was flowing at 113 cfs Thursday morning. 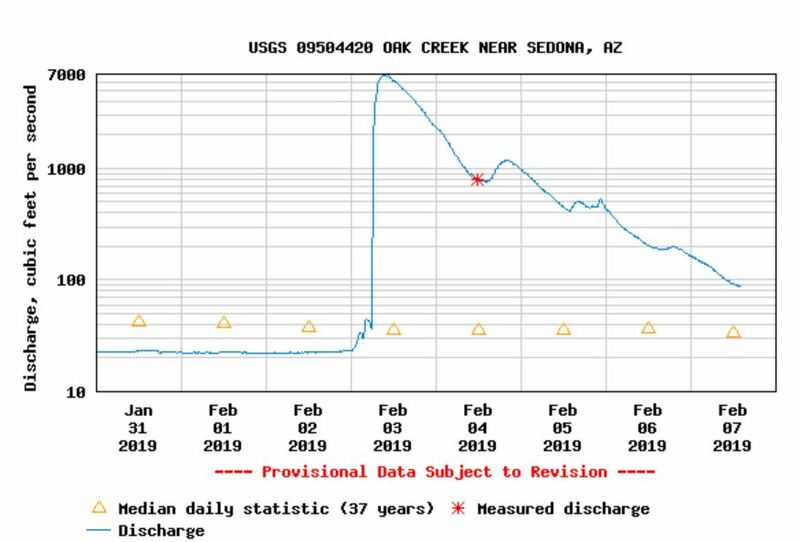 Check out this USGS graph and the spike in flows at Oak Creek near Sedona on Sunday: 10 cfs to 7,000 in less than 12 hours. Be safe during these storms and watch out for flash flooding! Water temperatures in many desert impoundments remain in the low-50s. There is another cold front moving through desert regions on Saturday. Crappie fishing remains extremely difficult due to these unstable periods of weather. Alex Martinez with an 11-pound, 9-ounce, 25-inch largemouth bass caught Tuesday, Jan. 22. He said he caught the fish at 4 p.m. at the lake by Mission and Ajo, slow-dragging a dropshot with a morning dawn Roboworm near the rocks. Rainbow trout: Parker Canyon Lake, Cluff Reservoir, Roper Lake, Dankworth Pond, Apache Lake, Canyon Lake, Dead Horse Lake or our “core” Community waters.